Today's been another interesting one - lots of different things are happening today. Well, it's now 9:30pm, so I should say did. It started out with Trev first thing (and I mean before his eyes were all the way open) playing Go Deigo Go, online, and that went on for probably over an hour. Then Wonder Pets for a bit, then Diego again. 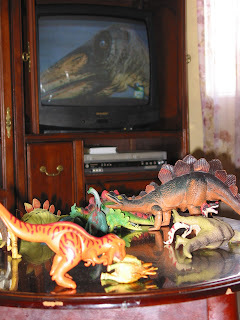 Then into the living room to watch Walking With Dinosaurs, which of course was reinacted and enhanced by a very careful scene of plastic friends. At first I came into the room (where I had planned on folding laundry on the already-being-used coffee table) and saw them, and thought "oh, dino piles everywhere", but then I took a closer look. The tyrannosaur was eating the felled stegosaurus, the small ornitholestes was eating an also felled parasaurolophus, and the rest of the herd (all herbivores) were over munching on a tree, a single one, presumably they were migrating to a land where there would be food enough for all. Most interesting. Later on they went to his room to find his forest animal sticker book, as he was in the mood to place some creatures into their natural habitat. A while later he found his forgotten book with cd of Dinosaurs! which he listened to several times. Started painting some more dinos that we picked up at the store this evening, but then his mama shot that idea down, as it was in the livingroom. Oh, no- no painting in the living room. At least not non-washables. I don't think he watched any cartoon network today.... even when he watched cartoons for a minute, I think it was nick jr. woohoo! I was worried because it seemed to me for a long while that cn was a very big part of his life, and I was concerned that he wasn't being inspired by anything else. At least- it seemed so to me. Not so lately, though, certainly! Maddie is now asleep on my lap, and she needs her britches changed and to be put into jammies. So I'm off.